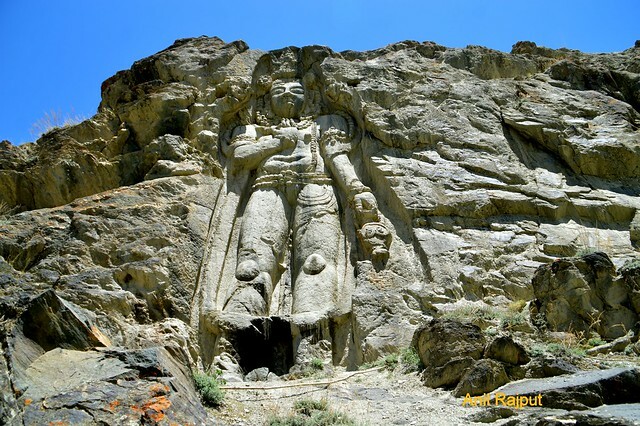 Kargil 5th century rock carved out statues are the only three statues left in the world after Bamiyan Buddha’s statues of 5th century were destroyed in Afghanistan . Kargil in Ladakh region of India is an ancient town situated on the junction and a transit point to the Silk route, traders from Central Asia, China, Tibet, Zanskar, North India traded the spices, tea, textile, rugs, dyes, through Kargil till 1947. Kargil which was also known as Purig , the popular language spoken here is Balti-Purig which is a dialect of a Tibetian , Zanskar people speak Bhoto . After the Shia Islam was introduced around 13th Century and in 16th Century The King Thi Namgyal directed his people conversion from Buddhist to Shia Islam, lots of Persian words and Phrases become part of the daily speaking language , the social celebrations like marriages still have Islamic and Buddhist common rituals. 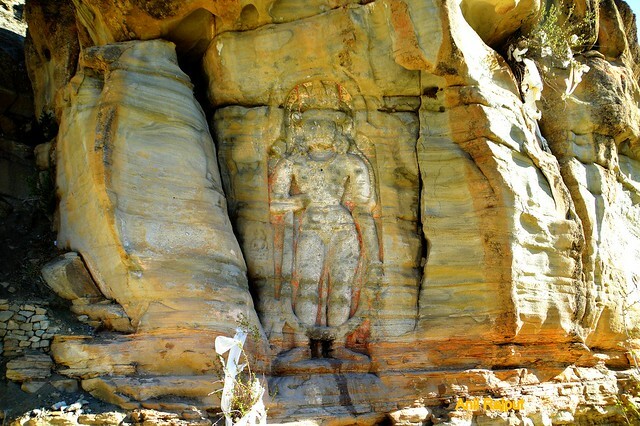 There are many statues and impressions which were made during the Buddhism period are beautiful rock carved statues of Maitreya Buddha exhibiting the skill and dedication of artists and devotion of people from that period. 42 Kms. from Kargil town is a village Karstekhar near Sankoo, on Kargil – Suru valley road , here a ten meter tall statue of Maitreya Buddha is cut out from a greyish yellow rock , it has been carved by the skillful artists , holes around it suggest that scaffolds were used to get such a tall statue carved out with very fine details on face, it is supposed to be carved in 7th Century. The Bodhistva Maitreya is in “Abhya Mudra” with right hand and left hand is carrying a “Kamandal” the water carrying pot , there are “Rudraksha Mala” tied on wrist and arm above the elbow , here we see “Janeu” and “Kardhani” the waist band are also of “Rudraksha” , decorative necklace and a headgear . Knotted hair are falling over the shoulders. Apati village is about 25 km from Kargil, one is to walk through a small green village settled along a water stream, after crossing the village and drain a beautiful Maitreya Buddha statue with right hand is in “Abhay Mudra” and in left hand is a “Kamandal” to carry water, the eyes are protruded out like Frog eyes, one can see the red colour in the parts above the shoulders and on the wall behind which has faded out with time . 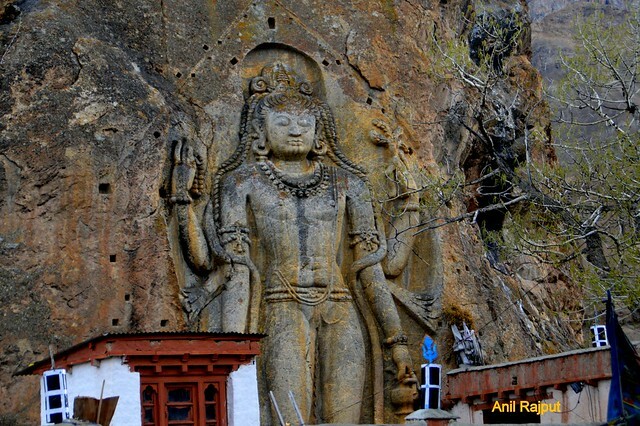 Mulbek is 42 km from Kargil on Srinagar-Leh highway , The Maitreya Buddha 9 meters tall is carved out in a rock with four arms , first right hand is in “Varada Mudra” , second right hand carrying “Rudraksha Mala” the Rosary, first left hand is carrying the “Kamandal” the water pot and second left hand is carrying branch with leaves. both the arms above the elbow and wrist are having Rudrasha mala tied around ,long ears are with “Kundals” ear rings ,neck is adorned with decorative necklaces . one can see a “Janeu” hanging from left shoulder till below the naval . knotted hair are falling over the shoulders . The statue here is completely different from Apati and Kartsekhar statues. 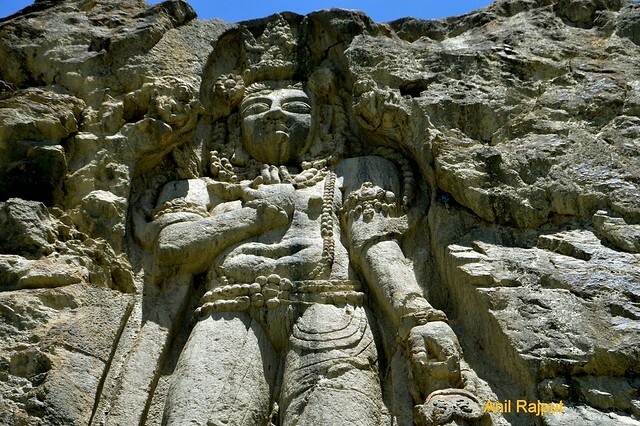 Drass is 65 km from Kargil on Leh-Srinagar highway , there are few stone statues partly recognizable as a Maitreya Buddha , Avalokivtesara , a horse rider , a Lotus flower and a stupa. These figures are supposed to be of pre Tibetan influence in the valley . 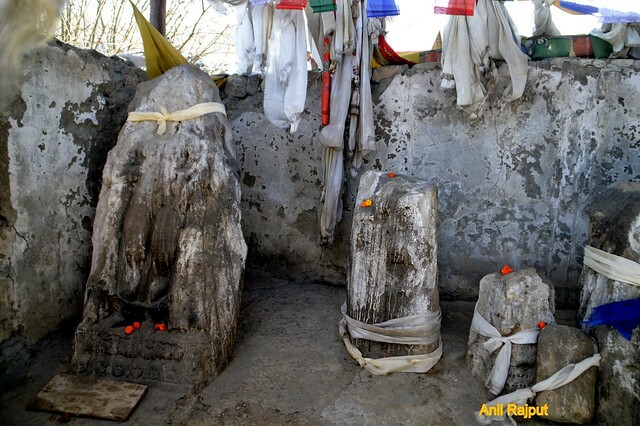 These three Buddhist rock carved statues in Kargil , India are only left in the world after the demolition of Bamiyan Buddha statue in Afghanistan .